Why is Justin Trudeau Silent on the Lauren Southern Affair? Lauren Southern is a right-wing Canadian journalist and activist. Conservative Canadian journalist Lauren Southern was detained and denied entry into the UK this week. Why hasn't Justin Trudeau spoken out? Much has been said in response to the recent tragedy in Las Vegas. Stephen Paddock, the gunman who killed at least fifty-nine people on Sunday night, allegedly had an astonishingly large arsenal of twenty-three firearms in the hotel room from which he committed the largest mass shooting in American history. Naturally, the debate immediately descended into a hyper-partisan shouting match between gun control advocates on the left and Second Amendment advocates on the right. In light of the immense emotion that has engulfed this discussion, it is worth dispassionately examining a few facts about guns in the United States. 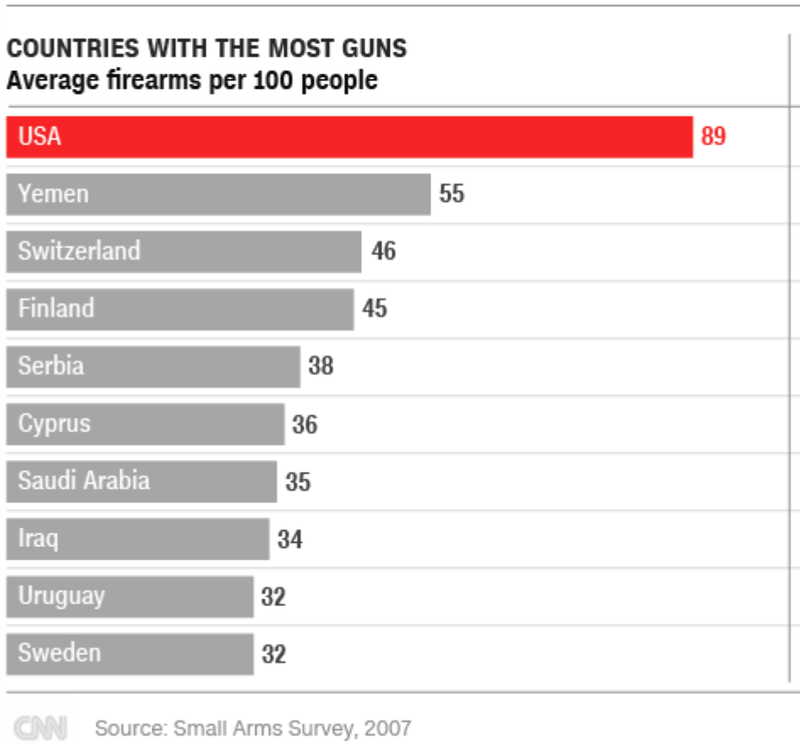 Fact #1: The United States has the highest per capita gun ownership rate in the world. There are about 89 guns for every 100 people in the United States. That is to say that there are roughly 312 million firearms owned by American civilians. This constitutes nearly half of all the privately-owned firearms in the world, despite Americans being only 4% of the global population. Moreover, according to a recent Pew Research Center study, of the entire United States population, roughly 40% either personally own a firearm or live in a home in which there is a firearm. This is an important fact due to Americans’ widely-perceived need for firearms. About two-thirds of Americans cite “protection” as being the number one reason for owning a gun, according to Pew. And this is an argument typically put forward by the political right. But, as we shall see from Fact #2 below, this perception fuels a vicious “chicken or the egg” type situation in which more guns may be contributing to more gun crime, which is in turn increasing the perceived need for guns for protection in the first place. Fact #2: Among OECD countries, the United States has the highest per capita rate of firearm-related homicides apart from Mexico. The United States registers 3.6 homicides per 100,000 people per year. That is right below Nicaragua (3.72) and right above Barbados (3.12). Western European countries register figures that are substantially lower than this. And out of the Western European countries, Italy has the highest number at 0.35 homicides per 100,000 people. This is roughly 1/10th of the American figure. To repeat: the highest figure in Western Europe is a tenth of the American figure. In France, it is 0.21. In Germany, it is 0.07. In the United Kingdom, it is 0.06, which is 1/60th of the rate in the United States. To repeat: the United Kingdom registers sixty times fewer homicides from guns as does the United States. It is often argued, mostly by those on the political right, that if one were to outlaw guns, “only the bad guys would be left with guns.” The reasoning goes as follows: law-abiding citizens would be always unarmed, whilst criminals will always find a way to acquire firearms via illicit means. The implication of such a statement is that higher gun ownership among the general population would deter would-be murderers and would allow oneself to protect oneself in the event of a life-threatening situation. But this doesn’t seem to be the case. Being cognizant of the fact that correlation doesn’t equal causation, what other factors might be in play that explain the far lower gun homicide rates in other OECD countries (again, with the exception of Mexico, which the IMF does not regard to be an “advanced economy”)? Is it all cultural? Are Americans simply more violent? Do Americans have a higher incidence of mental illness than citizens of other OECD countries? These are all questions that the political right must answer. Lastly, regarding the point about “protection” under Fact #1: how would higher gun ownership have helped in this most recent Las Vegas mass shooting? How can an armed populace neutralize a man with twenty-three semi automatic weapons firing from a high-rise hotel room window? Again, this is a question that must be addressed by gun advocates. Fact #3: Guns obtained by criminals are often originally procured via legal gun sellers. What is often lacking in the discussion about gun homicides is a question that should be asked from the outset, namely: how are criminals obtaining guns in the first place? Under such an arrangement, someone who wishes to own a firearm anonymously can ask someone else to purchase one on his or her behalf from a licensed gun seller. In fact, this is exactly how Rizwan Farook, one of the San Bernardino killers, obtained his firearms. The San Bernardino killers should never have been able to procure firearms. Furthermore, 90% of young prison inmates who were arrested with a firearm in their possession admitted to having procured said firearm through anonymous and indirect means. This can include straw purchases, gifts, and sharing arrangements. The important point to note is that the initial purchase of a firearm that eventually makes its way to criminals is almost always done through legal channels. Herein lies the exact problem with gun advocate logic: criminals are merely exploiting legal channels of gun procuration in order to obtain guns. Hence, it would appear that legalizing the sale of firearms is actually making it far easier for criminals to obtain firearms. Fact #4: States with higher gun ownership tend to have higher incidences of gun homicides. Gun advocates use statistics such as the chart below from the American Enterprise Institute to “prove” that higher gun ownership leads to less gun crime. However, what this chart does not tell us is how the gun homicide rate varies per state depending on each state’s gun ownership rates. This chart is highly misleading. Hence, the general downward trend in gun homicide in the US is more likely part of a larger pattern in the west whereby violent crime has been steadily decreasing in recent decades, regardless of each country’s individual gun laws. Fact #5: States with tough gun laws can witness high levels of gun crime due to out-of-state gun purchases. Following from Fact #4, it is true that stricter gun laws in one state do not always lead to a lessening of the gun homicide rate (although they often do) as long as guns are more easily available in other states. For example, an oft-cited fact by gun advocates is the fact that Chicago has some of the highest gun homicide rates in the country despite having some of the toughest gun laws as well. This is used as an argument to demonstrate the ostensible futility of gun control. Yet according to a study by Northwestern University, 60% of guns used by criminals in Chicago are imported from another state. Most of these guns come from Indiana, Mississippi, and Wisconsin: states with less restrictive gun laws. This is important to note because as long as guns are easily available in certain states with lax gun laws, we cannot conclude that gun control is futile in states with tougher gun laws. In fact, Fact #4 indicates the exact opposite, namely that tougher state gun laws do generally correlate with lower rates of gun crime. It is often stated that some western countries with high gun ownership also witness low levels of gun crime. Switzerland and Canada are often cited as examples. There are several reasons why this phenomenon might be. Perhaps, as in Switzerland, where military conscription is mandatory for males (the demographic that by far commits the most gun crimes), men are far better trained and disciplined with regard to firearms. Or perhaps, as in Canada, where semi automatic weapons are mostly banned, this could be a factor in the far fewer incidences of mass killing. Lastly, I would be remiss to engage in such a discussion without a mention of differences in culture. Culture, which I briefly mentioned under Fact #2, might have a lot to do with high rates of gun crime in the US. Perhaps the US is inherently a more violent society than other developed countries. There might be something to this. But in any case, if it were true, or even partially true, it too would be an argument for more gun control, not less. All in all, it seems that the facts surrounding the gun debate indicate that America’s experiment with high levels of gun ownership has been a failure. The political right should take note. This should be rectified before more incidents such as those that occurred in Las Vegas are able to repeat themselves. Who are we? What do we believe in? What are our cultural underpinnings? And do we still have the will to defend our civilization? This last question is vital, as it presupposes that we have already worked out the answers to the preceding questions. Because if one’s society cannot even define what it believes in, this immediately poses a grave paradox. For how can one defend a civilization whose purpose and identity one is incapable of defining in the first place? Douglas Murray’s latest book, The Strange Death of Europe: Immigration, Identity, Islam, attempts to explain just how we have arrived at our current state of cultural nihilism. It is a somber and poignant tale, often written more as a story than a political treatise. At many points it is unequivocally depressing. But regardless of one’s opinions of the book, at every turn of the page, nobody can question its author’s deep and profound attachment to western culture and his sense of urgency in calling for its revitalization. The book has garnered much attention- much of it positive and some of it glowing- for its perceived focus on the threat that Islam, in particular, poses to Western civilization in the modern day. But this would be a misunderstanding and an unfortunate dilution of Murray’s far more elaborate thesis. The fundamental threat to the west, according to Murray, is not Islam per se. Rather, it is our own cultural weaknesses, timidity, and vulnerability. For these are the perfect preconditions by which we can be superseded by a far more assured and confident culture. Today, the most obvious example of this is Islam. But in reality, it could be anything else, provided that its adherents have the zeal and fortitude to try to overturn our own way of life. Which brings us back to the questions posed at the beginning of this review. During the great civilizations of yore, questions as basic as these could have been answered by average citizens, or at least by the ruling elites, with relative ease. In Augustan Rome, for example, at the apex of western civilization, people could be relied upon to define their culture far more precisely and with far more vigor than we are able to do today. Denizens of the newly-formed empire were bound by the founding myth of Romulus and Remus. They openly professed a veneration for the Gods, who entrusted matters of temporal supervision to the pater patriae: Augustus himself. Art in Rome revolved around a glorification of the myth of Rome- its Gods, its victories in battle, and the fecundity of its splendid earth. Its architectural splendor was derived from both its harmony with the natural world as well as its assertion of man’s conquest of it. Its triumphal arches and monumental porticos were designed to arrest even the most doubtful of visitors. It was a civilization that was confident, robust, and unshakable. In some ways, Islamic culture is in a similar position of philosophical strength today. Murray argues that, unlike contemporary secular westerners, today’s Muslims are, like our Roman forbearers, able to answer civilizational questions with a reflexive fluency, certainty, and zeal that leaves them with little confusion as to the purpose of their lives. This leaves the confused and dithering westerner in a position of immense relative weakness. Murray has a deep distrust of the concept of multiculturalism in particular, which he feels is responsible for much of our current societal malaise. At its best, multiculturalism has spawned a confused cultural relativism among us. This is to say that it has given birth to the commonly-held view today that all cultures are of equal value. At worst, multiculturalism has led to cultural masochism: the belief that one’s culture is in fact the most rotten culture currently in existence. Regarding this last point about cultural masochism, Murray believes it is essentially the result of a shared collective guilt for the sins of our forbearers. Be it colonialism, Nazism, or even the Crusades, we are constantly reminded today of the negative contributions of western culture on the world. These discussions are seldom tempered by citing western civilization’s positive contributions to the world: Da Vinci, Plato, the internet. With a collapse in its own confidence in such spectacular fashion, Murray quite convincingly argues that western civilization has little prospects of survival. That is, unless things rapidly change. Murray recommends, first of all, to vastly slow down the pace of immigration from the Muslim world from its current number (estimated to be at least in the hundreds of thousands a year into Europe). The Trump phenomenon would have been a relevant topic to discuss, as Americans elected a man who at one point called for, “a total and complete shutdown of Muslims entering the United States.” This is rhetoric that goes far beyond anything that any mainstream European politician has ever said. The Strange Death of Europe is not a typical, light beach read by any means. Douglas Murray offers a very pessimistic prognosis of the west’s contemporary afflictions. He would argue that if the facts are bleak then this pessimism is warranted. I tend to agree, but I do hope I am wrong. The book is excellent. Is the New iPhone Islamophobic? Today Apple released its latest and greatest iPhone in order to celebrate the 10th anniversary of the product’s initial launch. Named the “iPhone X,” it contains a new technology called “Face ID” that lets one unlock one’s phone in a very novel way. Whereas previously one had to fiddle with fingerprints and numeric passcodes, Apple has now implemented facial recognition technology that allows one to stare directly into one’s phone and – voila! – one’s iPhone is unlocked ready for use. What a time to be alive, indeed. Unless you happen to be a fully veiled woman, I’d imagine, in which case this new technology would pretty much be useless. In the above video, one can see people of all races, genders, and subcultures using the new iPhone’s facial recognition technology. Noticeably absent, however, is a niqab or burqa-clad woman, precisely because this technology would not work for such a person. And not only are veiled women missing out on the practical uses of facial recognition technology; they are missing out on all the fun bits as well. With “Face ID,” one can, for example, create real-time emoji avatars that mimics one’s speech. 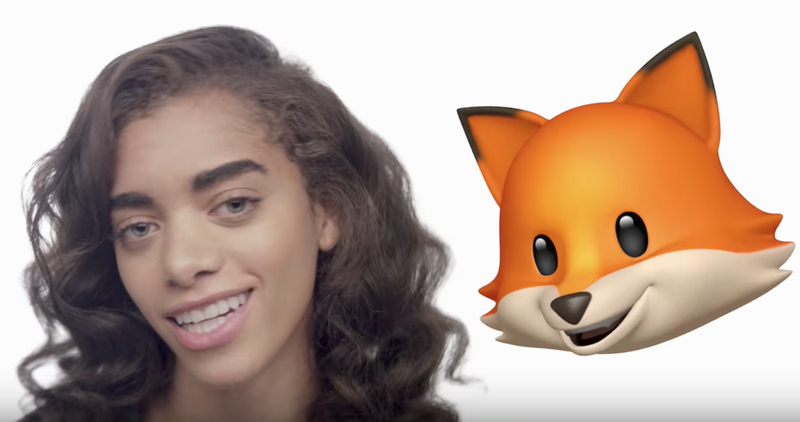 So if one ever feels the need to relay a message as a fox, unicorn, or monkey, Apple has now got you covered. But alas, those among us who decide to fully cover our faces will be unable to partake in all this fun. But then again, perhaps for those who cover their faces (or are coerced into doing so), the concept of “fun” is not very much encouraged anyway. And all this begs the question as to whether Apple should have decided to be a bit more “culturally sensitive” in implementing its new features on its latest iPhone. Is Apple even being slightly Islamophobic in failing to consider the sensitivities of veiled Muslim women? Of course Apple is not Islamophobic. Of course the new iPhone is not Islamophobic. But the new iPhone does inadvertently highlight the clash between the modern world and the medieval world. To conclude, Apple created its new “Face ID” technology under the assumption that it would be a very practical and useful tool to virtually everyone. In doing so, it has highlighted just how antisocial and impractical it is to fully cover one’s face in the modern world. The earth is now flat, the sun has risen to the west, up is down, left is right, and Hillary has finally admitted that she lost fair and square. Only that last part was a joke. Notwithstanding, something quite extraordinary has happened in the past few days that would have seemed totally impossible a mere few months ago. Donald Trump now has a higher domestic approval rating than Emmanuel Macron does. According to a recent Washington Post/ABC News poll, 37% of Americans have a “net favorable” opinion of Mr. Trump. And the latest YouGov data show that only 36% of the French public have a “net favorable” opinion of Mr. Macron. A difference of a mere percentage point, true. Yet it marks a precipitous decline for Mr. Macron, who started off his Presidency with a powerful mandate. It should be noted, however, that Mr. Trump’s “disapproval rating” is still higher than Mr. Macron’s, at 58% vs. 43%. This can be explained by the fact that a whopping 20% of the French public stated that they “didn’t know” how exactly they felt about Mr. Macron. Perhaps fewer people are immensely turned off by Mr. Macron as are by Mr. Trump. Perhaps America is a nation that is fundamentally more polarized than is France. Or perhaps Mr. Macron is just the type of person whom it is quite easy to feel ambivalent about. As I have argued before, this decline in popularity should have been entirely predictable. Mr. Macron was venerated in certain segments of French society with the zeal one would normally reserve for the Gods, Emma Watson, and Beyoncé. A harsh correction was always bound to set in after the hype collided with the constraints of reality. Babies were made the night of Mr. Macron's victory. It should be noted that Mr. Macron, thus far, has achieved nothing of substance. Nonetheless he has indicated that his much talked-about labor reforms will be pushed through parliament in September. We shall see. Mr. Macron would be wise, however, to note the date of September 12th, which is when the CGT (Confédération Générale du Travail), France’s largest trade union, has called for a day of protest against Mr. Macron’s proposed labor reforms. In France, these types of nation-wide strikes are ascribed a gravitas that they wouldn’t be granted in other western countries. They are perceived to be formidable displays of the common man fighting against the capitalist and neoliberal puppeteers who aim to dismantle France’s social protections. It will hence be difficult for Mr. Macron to stand up to these protests. But perhaps he will brush them aside in the same way he brushed aside Pierre de Villiers, his former army chief. During this ordeal, Mr. Macron publicly berated Mr. de Villiers by reminding the general that he is the “boss” and that he “requires no comment” on his policies. Maybe he will comport himself in a similarly defiant manner with the CGT. But if he capitulates, it will be seen as a major disappointment for those who believed him to catalyze the hope and change that France badly needs. Things could hence get even worse for the President. On verra.